Manfo (Ash), Oct 30, GNA - President John Agyekum Kufuor on Saturday inaugurated a 600 million-cedi school block for the Catholic primary at Manfo in the Ahafo-Ano North District. The six-classroom, office, store and staff common room was financed from the Ghana Education Trust Fund (GETFund). Addressing a durbar of chiefs and people, President Kufuor, who is on a six-day tour of Ashanti Region, said the Akwasiase-Manfo road and its surrounding towns roads had been awarded on contract and work would soon begin. He directed both the Ashanti and Brong-Ahafo Regional Co-ordinating councils to construct a bridge to link Acherensua to Manfo for easy accessibility for farming communities in the area. President reiterated his call to the electorate to ensure they vote for both the presidential and parliamentary candidates of the New Patriotic Party (NPP) in December. Nana Kwame Ntim, Manfohene, appealed to the government for the rehabilitation of the road to link other towns such as Dwaaho and Asuhyiae. He appealed for the provision of potable water to the area and a means of transport for the Manfo Health Centre to ensure efficient health delivery. Nana Ntim deplored the activities of chainsaw operators and appealed to the government for more police personnel in the area to curb the menace. President Kufuor also addressed similar durbars at Tepa and Mpasaso. At Tepa, the paramount chief, Nana Adusei Atwenewa Ampem, commended the government for the numerous development projects in the area. He said within the last few years, projects such as health, education, telephone facilities, water and roads in the area had been improved. Nana Atwenewa Ampem however appealed to the government to establish a Nurses Training College in the area to serve the numerous senior secondary school graduates in the area. 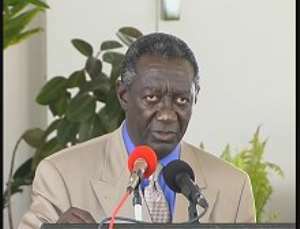 At Mpasaso, President Kufuor said the Wioso-Mpasaso-Wansamire-Bonsuaso roads would be rehabilitated. He said efforts would be made to put up a senior secondary school for the people in the area. President Kufuor called on the chiefs to make land available for the construction of a police station and accommodation for the personnel while the government would assist them with a vehicle. He said efforts would also be made to provide electricity to the area. Nana Tabiri Gyansah, Omanhene of Mpasaso Traditional Area, appealed to the government to rehabilitate the Wioso-Mpasaso-Nyamebekyere-Bonsuaso-Tepa-Wansamire and Kufuor Camp road to link the Kumasi-Bibiani main road. He also appealed for the extension of ele ctricity to the area. President Kufuor also addressed similar durbar at Mankranso in the Ahafo-Ano South district where he appealed to the people to vote massively for the NPP to enable it continue with its developmental projects.